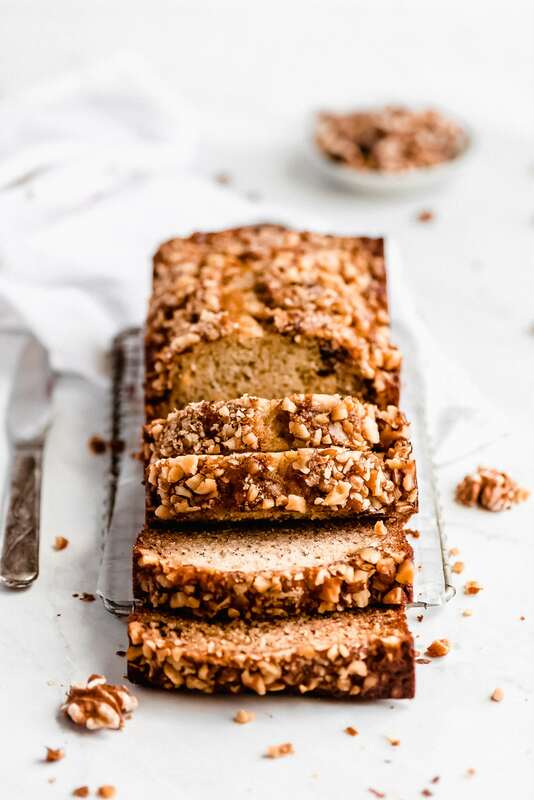 The BEST Banana Nut Bread is an ultra moist and tender quick bread topped with crunchy toasted walnuts. This recipe makes 2 loaves and only requires 1 mixing bowl. It’s sure to become a family favorite! Never let bananas go to waste! Make Banana Nut Bread! Bananas should never be thrown out. 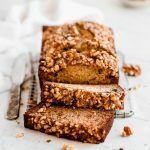 You can chop them up and freeze them or use them in delicious recipes like Banana Hazelnut Cake, Pineapple Spinach Green Smoothie (or really any smoothie), and Cinnamon Streusel Banana Coffee Cake. 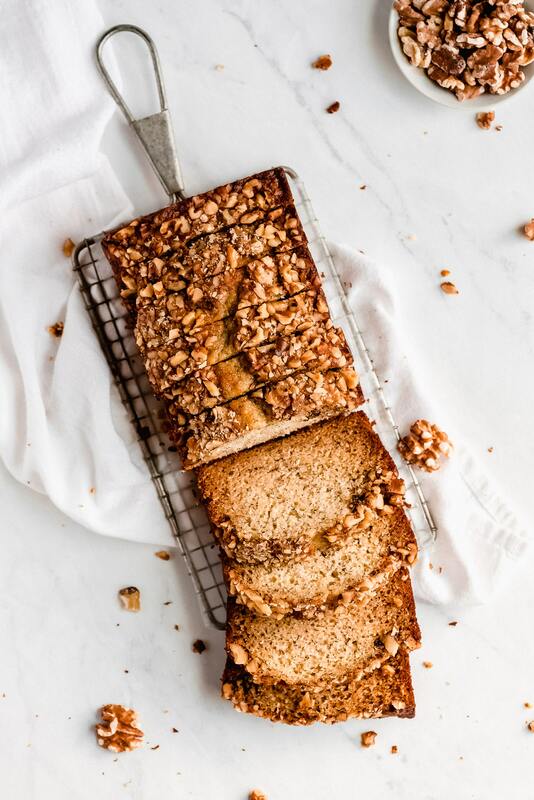 This Banana Nut Bread is great for when you find yourself with extra bananas hanging around but honestly, I buy extra bananas to make sure that I can make this bread about every other week. My whole family loves it and devours it in less than 3 days. This recipe makes 2 loaves so yeah, as a family of 4, we’re practically inhaling it. 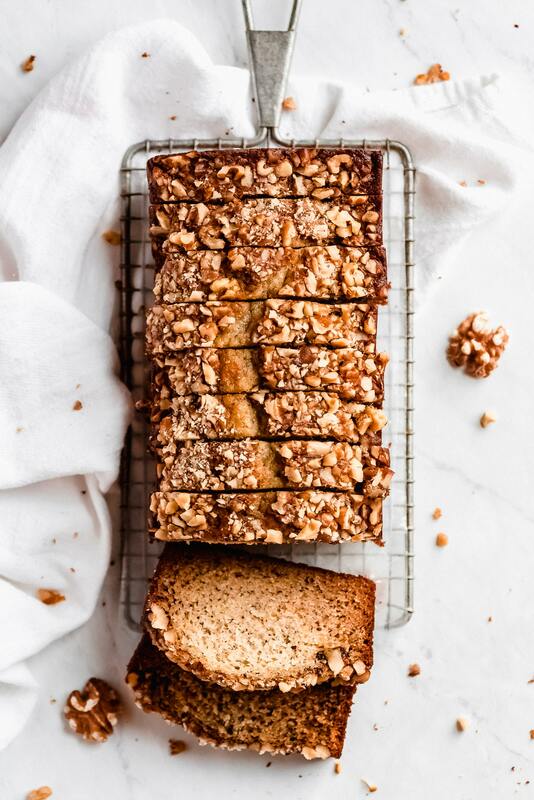 This is a recipe from my childhood and I have yet to find a better banana bread recipe. Whenever I smell it baking in the oven I remember baking in the kitchen with my mom… or rather sitting there licking the whisk and bowl clean while she baked. The batter to this bread is so incredibly good! I still lick the bowl if my kids don’t get to it first. Preheat the oven to 350°F. If using glass or a dark pan, reduce the temperature by 25°F to 325°F. Prepare two loaf pans by spraying with cooking oil. Whisk all the dry ingredients (flour, sugar, baking soda, baking powder, and salt) together in a mixing bowl. Push the contents in the bowl towards the sides to make a well. Mash up about 3 bananas. I like to do this in a pie dish using either a potato masher or a fork. To the middle of bowl, add the wet ingredients (milk, oil, mashed bananas, eggs, and vanilla). Mix until combined. Pour batter into pans, filling them equally. Sprinkle the nuts on top and then lightly press down so the nuts stick to the batter. Bake on the middle rack of the oven for 50-55 minutes. It will be done when a toothpick inserted into the middle comes out clean. Rest the baking pans on a cooling rack and when cool enough to handle (about 15-20 minutes) run a knife between the edges of the bread and the sides of the pan. Turn the pan over, tap each short end on the counter until the loaf falls out. Set on a cooling rack to cool completely. You can use whole wheat flour for part of the all-purpose flour. The most I recommend using is 1 cup. So you’d use 1 1/4 cup all-purpose flour with 1 cup whole wheat. I highly recommend using WHITE whole wheat flour as this has a lighter flavor than the traditional RED whole wheat variety. If you don’t have butter milk you can mix together 2/3 milk with 4 teaspoons lemon juice or white vinegar. If you want to cut down on fat and calories you can substitute half the oil for plain Greek yogurt. 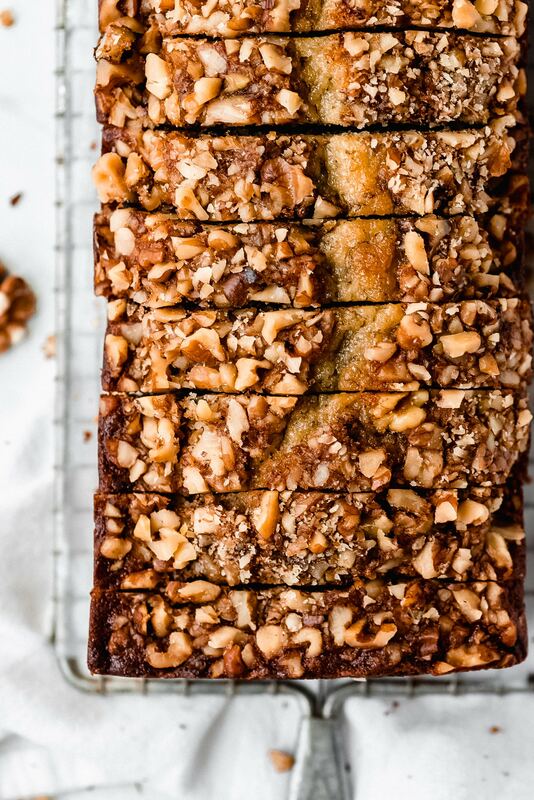 Walnuts taste amazing in this bread but you can omit them entirely or use pecans. My children don’t like nuts so I usually make one loaf without nuts. Store bananas in a warm area. Put bananas in paper bag and loosely close. This allow the ethylene gas to build up and that speeds the ripening process. Place ripe fruit like apples, tomatoes, peaches, avocados next to or in the paper bag with the bananas. The ethylene gas they produce will help the bananas ripen. With peels still intact, lay the bananas on a baking sheet and bake at 300°F. They are ready when the peels are shiny and black. You’ll need to check on them frequently. The length of time depends on how ripe they already were. If using this method bananas need to already be a little yellow. Bread Loaf Pan– This is the same one that I have but I have my eye on this lighter one because lighter colored pans are better for baking. 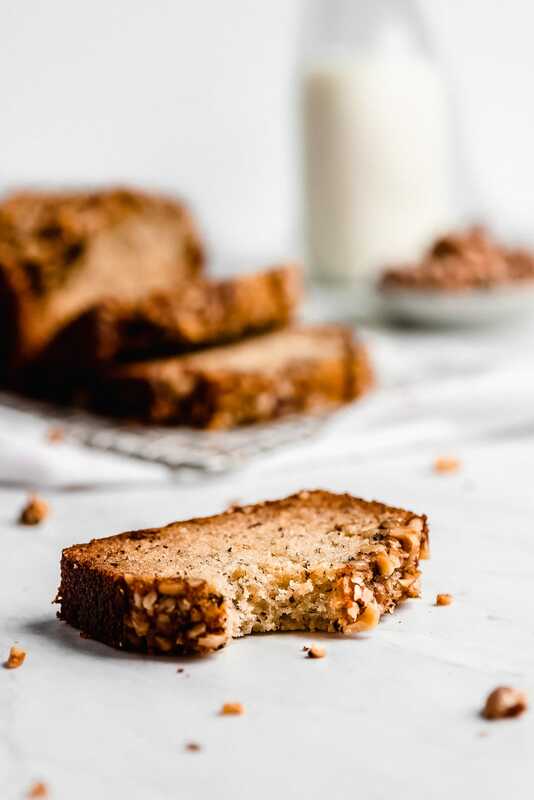 The BEST Banana Nut Bread is an ultra moist and tender quick bread topped with crunchy toasted walnuts. This recipe makes 2 loaves and only requires 1 mixing bowl. This is sure to become a family favorite! Preheat oven to 350°F (if your pans are dark in color, cook at 325°F). Grease two bread pans with cooking spray. In a large bowl mix together flour, sugar, soda, powder, and salt. Make a well in the dry ingredients by pushing them to the sides of the bowl. To the well, add the eggs, milk, oil, mashed bananas, and vanilla. Mix until combined. Pour batter into prepared pans filling them to equal levels. Sprinkle walnuts evenly over batter and then lightly press on the walnuts to make sure they are all touching the batter (don't push them all the way in). Bake for 50-55 minutes until toothpick comes out clean when inserted into the middle of the loaf. Let the loaves sit until cool enough to hand. Run a knife around the sides of the bread, turn the pan upside down and tap each short end of the pan on the counter. It should fall right out. Place on a cooling rack to cool completely. *You can use whole wheat flour for part of the all-purpose flour. Use 1 1/4 cup all-purpose flour with 1 cup WHITE whole wheat. **If you don't have buttermilk you can mix together 2/3 milk with 4 teaspoons lemon juice or white vinegar. Nuts on top, I like it. Then my kids who don’t like nuts can just cut them off the top and give them to me rather them pick them out of their piece! Yogurt works huh? I haven’t tried that. I’ve used half apple sauce. I will have to try that. Haha! That’s some tough work picking nuts out of the middle of bread! But yeah yogurt works well for replacing half the oil. You can also use sour cream which I do when I don’t have plain yogurt on hand. I’ll have to try using apple sauce sometime.